Teahouse of the August Noon. 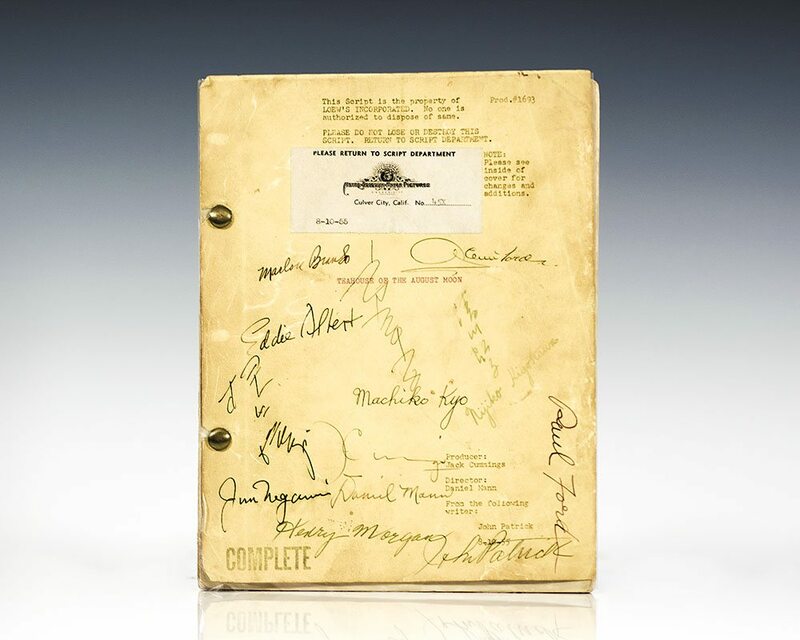 Teahouse of the August Moon production script signed by Marlon Brando, Glenn Ford, and other cast and crew. Quarto, original studio bound and bradded 128-page complete production script. The script has been signed on the front panel by Marlon Brando, Glenn Ford, Paul Ford, Betty Albert, Machiko Kyo, Paul Ford, June Negami, Harry Morgan, Nijiko Kiyokawa, Jane Chung, writer John Patrick, and director Daniel Mann. In very good condition. Scripts signed by Brando are uncommon, most rare and desirable signed by such a number of participants of a groundbreaking film. Marlon Brando attended the Shattuck Military Academy in Fairbault, Minnesota after being expelled from his local high school for reportedly riding a motorcycle through the halls of the school. He lasted a brief period at Shattuck before being expelled again, after which he followed his two elder sisters to New York to study acting at the American Theatre Wing Professional School with influential German director Erwin Piscator. Brando's early career began on Broadway with the drama I Remember Mama in 1944 and his first screen role was as a paraplegic veteran in The Men in 1950. He played Sakini, a Japanese interpreter for the U.S. Army in postwar Japan in the satirical comedy The Teahouse of the August Moon in 1956 and spent two months studying the local culture, speech, and gestures to prepare for the role. Brando was known for his wild nature and refusal to memorize scripts (he preferred the use of cue cards) to keep his acting real and spontaneous, his performance as Stanley Kowalski in A Streetcar Named Desire is regarded as his greatest and earned him his first Academy Award in 1951.